In September 2011, when German appointee to the Governing Council and Executive board, Jürgen Stark, resigned in protest of the ECB's "Securities Market Programme" which involved the purchase of sovereign bonds by the ECB, a move that was up until then considered as prohibited by the EU Treaty. The Financial Times Deutschland referred to this episode as "the end of the ECB as we know it" referring to its perceived "hawkish" stance on inflation and its historical Bundesbank influence. In April 2011, the ECB raised interest rates for the first time since 2008 from 1% to 1.25%, with a further increase to 1.50% in July 2011. However, in 2012–2013 the ECB sharply lowered interest rates to encourage economic growth, reaching the historically low 0.25% in November 2013. Soon after the rates were cut to 0.15%, then on 4 September 2014 the central bank reduced the rates by two thirds from 0.15% to 0.05%. Recently, the interest rates were further reduced reaching 0.00%, the lowest rates on record. The primary objective of the European Central Bank, set out in Article 127(1) of the Treaty on the Functioning of the European Union, is to maintain price stability within the Eurozone. The Governing Council in October 1998 defined price stability as inflation of under 2%, “a year-on-year increase in the Harmonised Index of Consumer Prices (HICP) for the euro area of below 2%” and added that price stability ”was to be maintained over the medium term”. (Harmonised Index of Consumer Prices) Unlike for example the United States Federal Reserve System, the ECB has only one primary objective but this objective has never been defined in statutory law, and the HICP target can be termed ad-hoc. Maintaining the payment system to promote smooth operation of the financial market infrastructure under the TARGET2 payments system and being currently developed technical platform for settlement of securities in Europe (TARGET2 Securities). Issuing banknotes: the ECB holds the exclusive right to authorise the issuance of euro banknotes. Member states can issue euro coins, but the amount must be authorised by the ECB beforehand (upon the introduction of the euro, the ECB also had exclusive right to issue coins). The Executive Board is responsible for the implementation of monetary policy (defined by the Governing Council) and the day-to-day running of the bank. It can issue decisions to national central banks and may also exercise powers delegated to it by the Governing Council. Executive Board members are assigned a portfolio of responsibilities by the President of the ECB. The Executive Board normally meets every Tuesday. It is composed of the President of the Bank (currently Mario Draghi), the Vice-President (currently Luis de Guindos) and four other members. They are all appointed[by whom?] for non-renewable terms of eight years. Member of the Executive Board of the ECB are appointed "from among persons of recognised standing and professional experience in monetary or banking matters by common accord of the governments of the Member States at the level of Heads of State or Government, on a recommendation from the Council, after it has consulted the European Parliament and the Governing Council of the ECB". José Manuel González-Páramo, a Spanish member of the Executive Board since June 2004, was due to leave the board in early June 2012 and no replacement had been named as of late May 2012. The Spanish had nominated Barcelona-born Antonio Sáinz de Vicuña, an ECB veteran who heads its legal department, as González-Páramo's replacement as early as January 2012 but alternatives from Luxembourg, Finland, and Slovenia were put forward and no decision made by May. After a long political battle and delays due to the European Parliament's protest over the lack of gender balance at the ECB, Luxembourg's Yves Mersch, was appointed as González-Páramo's replacement. The Governing Council is the main decision-making body of the Eurosystem. 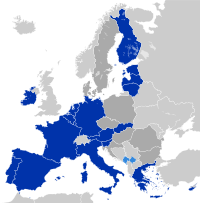 It comprises the members of the Executive Board (six in total) and the governors of the National Central Banks of the euro area countries (19 as of 2015). Since January 2015, ECB publishes on its website a summary of the Governing Council deliberations ("accounts"). These publications came as a partial response to recurring criticism against the ECB's opacity. However in contrast with other central banks, the ECB still does not disclose individual voting records of the governors seating in its Council. In addition to capital subscriptions, the NCBs of the member states participating in the euro area provided the ECB with foreign reserve assets equivalent to around €40 billion. The contributions of each NCB is in proportion to its share in the ECB's subscribed capital, while in return each NCB is credited by the ECB with a claim in euro equivalent to its contribution. 15% of the contributions was made in gold, and the remaining 85% in US dollars and UK dollars. The European Central Bank (and by extension, the Eurosystem) is often considered as the "most independent central bank in the world". In general terms, this means that the Eurosystem tasks and policies can be discussed, designed, decided and implemented in full autonomy, without pressure, or need for instructions from any external body. The main justification for the ECB independence is that such institutional setup helps maintaining price stability. Political independence: The Community institutions and bodies and the governments of the member states may not seek to influence the members of the decision-making bodies of the ECB or of the NCBs in the performance of their tasks. Symmetrically, EU institutions and national governments are bound by the treaties to respect the ECB's independence. Operational and legal independence: the ECB has all required competences to achieve its price stability mandate and thereby can steer monetary policy in full autonomy and by means of high level of discretion. The ECB's governing council deliberates with a high degree of secrecy, since individual voting records are not disclosed to the public (leading to suspicions that Governing Council members are voting along national lines.) In addition to monetary policy decisions, the ECB has the right to issue legally binding regulations, within its competence and if the conditions laid down in Union law are fulfilled, it can sanction non-compliant actors if they violate legal requirements laid down in directly applicable Union regulations. The ECB's own legal personality also allows the ECB to enter into international legal agreements independently from other EU institutions, and be party of legal proceedings. Finally, the ECB can organise its internal structure as it sees fit. Personal independence: the mandate of ECB board members is purposefully very long (8 years) and Governors of national central banks have a minimum renewable term of office of five years. In addition, ECB board members and are vastly immune from judicial proceedings. Indeed, removals from office can only be decided by the Court of Justice of the European Union (CJEU), under the request of the ECB's Governing Council or the Executive Board (i.e. the ECB itself). Such decision is only possible in the event of incapacity or serious misconduct. National governors of the Eurosystem' national central banks can be dismissed under national law (with possibility to appeal) in case they can no longer fulfil their functions or are guilty of serious misconduct. Financial independence: the ECB is the only body within the EU whose statute guarantees budgetary independence through its own resources and income. The ECB uses its own profits generated by its monetary policy operations and cannot be technically insolvent. The ECB's financial independence reinforces its political independence. Because the ECB does not require external financing and symmetrically is prohibited from direct financing to public institutions, this shields it from potential pressure from public authorities. In addition to its independence, the ECB is subject to limited transparency obligations in contrast to EU Institutions standards and other major central banks. Indeed, as pointed out by Transparency International, "The Treaties establish transparency and openness as principles of the EU and its institutions. They do, however, grant the ECB a partial exemption from these principles. According to Art. 15(3) TFEU, the ECB is bound by the EU’s transparency principles “only when exercising [its] administrative tasks” (the exemption – which leaves the term “administrative tasks” undefined – equally applies to the Court of Justice of the European Union and to the European Investment Bank)." Voting secrecy: while other central banks publish the voting record of its decision makers, the ECB's Governing Council decisions are made in full discretion. Since 2014 however, the ECB publishes "accounts" of its monetary policy meetings, but those remain rather vague and do not include individual votes. Access to documents: The obligation for EU bodies to make documents freely accessible after a 30-year embargo applies to the ECB. However, under the ECB’s Rules of Procedure the Governing Council may decide to keep individual documents classified beyond the 30-year period. Disclosure of securities: The ECB is less transparent than the Fed when it comes to disclosing the list of securities being held in its balance sheet under monetary policy operations such as QE. In return to its high degree of independence and discretion, the ECB is accountable to the European Parliament (and to a lesser extent to the European Court of Auditors, the European Ombudsman and the Court of Justice of the EU (CJEU). Although no interinstitutional agreement exists between the European Parliament and the ECB to regulate the ECB's accountability framework, it has been inspired by a resolution of the European Parliament adopted in 1998 which was then informally agreed with the ECB and incorporated into the Parliament's rule of procedure. Annual report: the ECB is bound to publish reports on its activities and has to address its annual report to the European Parliament, the European Commission, the Council of the European Union and the European Council. In return, the European Parliament evaluates the past activities to the ECB via its annual report on the European Central Bank (which is essentially a non legally-binding list of resolutions). Quarterly hearings: the Economic and Monetary affairs Committee of the European Parliament organises a hearing (the "Monetary Dialogue") with the ECB every quarter, allowing members of parliament to address oral questions to the ECB president. Parliamentary questions: all Members of the European Parliament have the right to address written questions to the ECB president. The ECB president provides a written answer in about 6 weeks. Appointments: The European Parliament is consulted during the appointment process of executive board members of the ECB. Legal proceedings: the ECB' own legal personality allows civil society or public institutions to file complaints against the ECB to the Court of Justice of the EU. In 2013, an interinstitutional agreement was reached between the ECB and the European Parliament in the context of the establishment of the ECB's Banking Supervision. This agreement sets broader powers to the European Parliament then the established practice on the monetary policy side of the ECB's activities. For example, under the agreement, the Parliament can veto the appointment of the Chair and Vice-Chair of the ECB's supervisory board, and may approve removals if requested by the ECB. Think-tanks such as the World Pensions Council have also argued that European legislators have pushed somewhat dogmatically for the adoption of the Basel II recommendations, adopted in 2005, transposed in European Union law through the Capital Requirements Directive (CRD), effective since 2008. In essence, they forced European banks, and, more importantly, the European Central Bank itself (e.g. when gauging the solvency of financial institutions) to rely more than ever on standardised assessments of credit risk marketed by two non-European private agencies: Moody's and S&P. In the United States, the Federal Reserve System purchases Treasury securities in order to inject liquidity into the economy. The Eurosystem, on the other hand, uses a different method. There are about 1,500 eligible banks which may bid for short-term repo contracts of two weeks to three months duration. To qualify for participation in the auctions, banks must be able to offer proof of appropriate collateral in the form of loans to other entities. These can be the public debt of member states, but a fairly wide range of private banking securities are also accepted. The fairly stringent membership requirements for the European Union, especially with regard to sovereign debt as a percentage of each member state's gross domestic product, are designed to ensure that assets offered to the bank as collateral are, at least in theory, all equally good, and all equally protected from the risk of inflation. From late 2009 a handful of mainly southern eurozone member states started being unable to repay their national Euro-denominated government debt or to finance the bail-out of troubled financial sectors under their national supervision without the assistance of third parties. This so-called European debt crisis began after Greece's new elected government stopped masking its true indebtedness and budget deficit and openly communicated the imminent danger of a Greek sovereign default. Foreseeing a possible sovereign default in the eurozone, the general public, international and European institutions, and the financial community reassessed the economic situation and creditworthiness of some Eurozone member states, in particular Southern countries. Consequently, sovereign bonds yields of several Eurozone countries started to rise sharply. This provoked a self-fulfilling panic on financial markets: the more Greek bonds yields rose, the more likely a default became possible, the more bond yields increased in turn. This panic was also aggravated because of the inability of the ECB to react and intervene on sovereign bonds markets for two reasons. First, because the ECB's legal framework normally forbids the purchase of sovereign bonds (Article 123. TFEU). This prevented the ECB from implementing quantitative easing like the Federal Reserve and the Bank of England did as soon as 2008, which played an important role in stabilizing markets. Secondly, a decision by the ECB made in 2005 introduced a minimum credit rating (BBB-) for all Eurozone sovereign bonds to be eligible as collateral to the ECB's open market operations. This meant that if a private rating agencies were to downgrade a sovereign bond below that threshold, many banks would suddenly become illiquid because they would lose access to ECB refinancing operations. According to former member of the governing council of the ECB Athanasios Orphanides, this change in the ECB's collateral framework "planted the seed" of the euro crisis. Faced with those regulatory constraints, the ECB led by Jean-Claude Trichet in 2010 was reluctant to intervene to calm down financial markets. Up until May 6, 2010, Trichet formally denied at several press conferences the possibility of the ECB to embark into sovereign bonds purchases, even though Greece, Portugal, Spain and Italy faced waves of credit rating downgrades and increasing interest rate spreads. On 10 May 2010, the ECB announced the launch of a "Securities Market Programme" (SMP) which involved the discretionary purchase of sovereign bonds in secondary markets. Extraordinarily, the decision was taken by the Governing Council during a teleconference call only three days after the ECB's usual meeting of May 6 (when Trichet still denied the possibility of purchasing sovereign bonds). The ECB justified this decision by the necessity to "address severe tensions in financial markets." The decision also coincided with the EU leaders decision of May 10 to establish the European Financial Stabilisation mechanism, which would serve as a crisis fighting fund to safeguard the euro area from future sovereign debt crisis. The's ECB bond buying focused primarily on Spanish and Italian debt. They were intended to dampen international speculation against those countries, and thus avoid a contagion of the Greek crisis towards other Eurozone countries. The assumption is that speculative activity will decrease over time and the value of the assets increase. Although SMP did involve an injection of new money into financial markets, all ECB injections were "sterilized" through weekly liquidity absorption. So the operation was neutral for the overall money supply. As of 18 June 2012, the ECB in total had spent €212.1bn (equal to 2.2% of the Eurozone GDP) for bond purchases covering outright debt, as part of the Securities Markets Programme. Controversially, the ECB made substantial profits out of SMP, which were largely redistributed to Eurozone countries. In 2013, the Eurogroup decided to refund those profits to Greece, however the payments were suspended over 2014 until 2017 over the conflict between Yanis Varoufakis and ministers of the Eurogroup. In 2018, profits refunds were reinstalled by the Eurogroup. However, several NGOs complained that a substantial part of the ECB profits would never be refunded to Greece. In November 2010, it became clear that Ireland would not be able to afford to bail out its failing banks, and Anglo Irish Bank in particular which needed around 30 billions euros, a sum the government obviously neither could it borrow from financial markets when its bond yields were soaring to comparable levels with the Greek bonds. Instead, the governments issued a 31bn EUR "promissory note" (an IOU) to Anglo – which it had nationalized. In turn, the bank supplied the promissory note as collateral to the Central Bank of Ireland as collateral, so it could access emergency liquidity assistance (ELA). This way, Anglo was able to repay its bondholders. The operation became very controversial, as it basically shifted Anglo's private debts onto the government's balance sheet. It became clear later that the ECB played a key role in making sure the Irish Government did not let Anglo default on its debts, in order to avoid a financial instability risks. In 15 October and 6 November 2010, the ECB President Jean-Claude Trichet sent two secret letters to the Irish finance Minister which essentially informed the Irish government of the possible suspension of ELA's credit lines, unless the Government requested a financial assistance programme to the Eurogroup under condition of further reforms and fiscal consolidation. Over 2012 and 2013, the ECB repeatedly insisted that the promissory note should be repaid in full, and refused the Government's proposal to swap the notes with a long-term (and less costly) bond until February 2013. In addition, the ECB insisted that no debt restructuring (or bail-in) should be applied to the nationalized banks' bondholders, a measure which could have saved Ireland 8 billions euros. In short, fearing a new financial panic, the ECB took extraordinary measures to avoid at all cost debt restructuring in Ireland, which resulted in higher public debt in Ireland. Soon after Mario Draghi took over the presidency of the ECB, the bank announced on 8 December 2011 a new round of 1% interest loans with a term of three years (36 months) – the Long-term Refinancing operations (LTRO). Thanks to this operation, 523 Banks tapped as much as €489.2 bn (US$640 bn). The loans were not offered to European states, but government securities issued by European states would be acceptable collateral as would mortgage-backed securities and other commercial paper that have a sufficient rating by credit agencies. Observers were surprised by the volume of the loans made when it was implemented. By far biggest amount of €325bn was tapped by banks in Greece, Ireland, Italy and Spain. This way the ECB tried to make sure that banks have enough cash to pay off €200bn of their own maturing debts in the first three months of 2012, and at the same time keep operating and loaning to businesses so that a credit crunch does not choke off economic growth. It also hoped that banks would use some of the money to buy government bonds, effectively easing the debt crisis. On 29 February 2012, the ECB held a second 36-month auction, LTRO2, providing eurozone banks with further €529.5 billion in low-interest loans. This second long term refinancing operation auction saw 800 banks take part. Net new borrowing under the February auction was around €313 billion – out of a total of €256bn existing ECB lending €215bn was rolled into LTRO2. In July 2012, in the midst of renewed fears about sovereigns in the eurozone, Draghi stated in a panel discussion in London that the ECB "...is ready to do whatever it takes to preserve the Euro. And believe me, it will be enough." This statement led to a steady decline in bond yields for eurozone countries, in particular Spain, Italy and France. In light of slow political progress on solving the eurozone crisis, Draghi's statement has been seen as a key turning point in the fortunes of the eurozone. Following up on Draghi's speech, the Governing Council of the European Central Bank (ECB) announced on 2 August 2012, that it "may undertake outright open market operations of a size adequate to reach its objective" in order to "safeguarding an appropriate monetary policy transmission and the singleness of the monetary policy". The technical framework of these operations was formulated on 6 September 2012 when the ECB announced the launch of the Outright Monetary Transactions programme (OMT). On the same date, the bank's Securities Markets Programme (SMP) was terminated. While the duration of the previous SMP was temporary, OMT has no ex-ante time or size limit. However, the activation of the purchases remains conditioned to the adherence by the benefitting country to an adjustment programme to the ESM. To date, OMT was never actually implemented by the ECB. However it is considered that its announcement (together with the "whatever it takes" speech) significantly contributed in stabilizing financial markets and ended the sovereign debt crisis. Although the sovereign debt crisis was almost solved by 2014, the ECB started to face a repeated decline in the Eurozone inflation rate, indicating that the economy was going towards a deflation. Responding to this threat, the ECB announced on 4 September 2014 the launch of two bond buying purchases programmes: the Covered Bond Purchasing Programme (CBPP3) and Asset-Backed Securities Programme (ABSPP). On 22 January 2015, the ECB announced an extension of those programmes within a full-fledge "quantitative easing" programme which also included sovereign bonds, to the tune of 60 billion euros per month up until at least September 2016. The programme was started on 9 March 2015. The program was repeatedly extended to reach about €2,500 billons and is currently expected to last until at least end of 2018. The new ECB headquarters, which opened in 2014. The bank is based in Ostend (East End), Frankfurt am Main. The city is the largest financial centre in the Eurozone and the bank's location in it is fixed by the Amsterdam Treaty. The bank moved to new purpose-built headquarters in 2014 that were designed by a Vienna-based architectural office, Coop Himmelbau. The building is approximately 180 metres (591 ft) tall and will be accompanied with other secondary buildings on a landscaped site on the site of the former wholesale market in the eastern part of Frankfurt am Main. The main construction began in October 2008, and it was expected that the building will become an architectural symbol for Europe. While it was designed to accommodate double the number of staff who operate in the former Eurotower, that building has been retained since the ECB took responsibility for banking supervision and more space was hence required. ^ The process is similar, though on a grand scale, to an individual who every month charges $10,000 on his or her credit card, pays it off every month, but also withdraws (and pays off) an additional $10,000 each succeeding month for transaction purposes. Such a person is operating "net borrowed" on a continual basis, and even though the borrowing from the credit card is short term, the effect is a stable increase in the money supply. If the person borrows less, less money circulates in the economy. If he or she borrows more, the money supply increases. An individual's ability to borrow from his or her credit card company is determined by the credit card company: it reflects the company's overall judgment of its ability to lend to all borrowers, and also its appraisal of the financial condition of that one particular borrower. The ability of member banks to borrow from the central bank is fundamentally similar. ^ a b c d "ECB: Key interest rates". Retrieved 14 September 2014. ^ a b c d e f "Capital Subscription". European Central Bank. Retrieved 1 January 2015. ^ a b c "ECB: Economic and Monetary Union". ECB. Retrieved 15 October 2007. ^ a b "European Central Bank". CVCE. 7 August 2016. Retrieved 18 February 2014. ^ a b c d "ECB: Economic and Monetary Union". Ecb.int. Retrieved 26 June 2011. ^ a b c "The third stage of Economic and Monetary Union". CVCE. 7 August 2016. Retrieved 18 February 2014. ^ "The powerful European Central Bank [E C B] in the heart of Frankfurt/Main – Germany – The Europower in Mainhattan – Enjoy the glances of euro and europe....03/2010....travel round the world....:)". UggBoy♥UggGirl [PHOTO // WORLD // TRAVEL]. Flickr. 6 March 2010. Retrieved 14 October 2011. ^ Proissl, von Wolfgang (9 September 2011). "Das Ende der EZB, wie wir sie kannten" [The end of the ECB, as we knew it]. Kommentar. Financial Times Deutschland (in German). Archived from the original on 15 October 2011. ^ Blackstone, Brian (2011). "ECB Raises Interest Rates – MarketWatch". marketwatch.com. Retrieved 14 July 2011. ^ "ECB: Key interest rates". 2011. Retrieved 29 August 2011. ^ "Draghi slashes interest rates, unveils bond buying plan". Europe News.Net. 4 September 2014. Retrieved 5 September 2014. ^ "ECB: Monetary Policy". Retrieved 14 September 2014. ^ a b Fairlamb, David; Rossant, John (12 February 2003). "The powers of the European Central Bank". BBC News. Retrieved 16 October 2007. ^ a b c d e f "ECB: Governing Council". ECB. ecb.int. 1 January 2002. Retrieved 28 October 2011. ^ "Distribution of responsibilities among the Members of the Executive Board of the ECB" (PDF). ^ Marsh, David, "Cameron irritates as euro’s High Noon approaches", MarketWatch, 28 May 2012. Retrieved 29 May 2012. ^ "Tag: José Manuel González-Páramo". Financial Times Money Supply blog entries. 18–23 January 2012. Retrieved 14 September 2014. ^ Davenport, Claire. "EU parliament vetoes Mersch, wants woman for ECB". U.S. Retrieved 3 October 2018. ^ "Mersch Named to ECB After Longest Euro Appointment Battle". Bloomberg. 23 November 2012. Retrieved 14 September 2014. ^ "ECB: Decision-making bodies". Retrieved 14 September 2014. ^ "Monetary policy accounts published in 2016". ^ "Subscribe to read". Financial Times. Retrieved 23 September 2018. ^ "Members of the Governing Council". Archived from the original on 17 July 2004. Retrieved 22 September 2018. ^ "Composition of the European Central Bank". CVCE. Retrieved 18 February 2014. ^ "ECB: General Council". European Central Bank. Retrieved 4 January 2015. ^ a b c "Supervisory Board". European Central Bank. Retrieved 3 December 2015. ^ "ECB SSM Supervisory Board Members". Frankfurt: ECB. 1 March 2019. Retrieved 1 March 2019. ^ Bank, European Central. "The European Central Bank: independent and accountable". European Central Bank. Retrieved 5 November 2017. ^ Bank, European Central. "The role of the Central Bank in the United Europe". European Central Bank. Retrieved 5 November 2017. ^ Papadia, Francesco; Ruggiero, Gian Paolo (1 February 1999). "Central Bank Independence and Budget Constraints for a Stable Euro". Open Economies Review. 10 (1): 63–90. doi:10.1023/A:1008305128157. ISSN 0923-7992. ^ Wood, Geoffrey. "Is the ECB Too Independent?". WSJ. Retrieved 5 November 2017. ^ a b "Independence". European Central Bank. Retrieved 1 December 2012. ^ Bank, European Central. "Why is the ECB independent?". European Central Bank. Retrieved 5 November 2017. ^ EU, Transparency International (28 March 2017). "Transparency International EU - The global coalition against corruption in Brussels". transparency.eu. Retrieved 5 November 2017. ^ Friedrich Heinemann and Felix Huefner (2004) 'Is the view from the Eurotower purely European? National divergence and ECB interest rate policy', Scottish Journal of Political Economy 51(4):544-558. ^ Jose Ramon Cancelo, Diego Varela and Jose Manuel Sanchez-Santos (2011) 'Interest rate setting at the ECB: Individual preferences and collective decision making', Journal of Policy Modeling 33(6): 804-820. DOI. ^ "PRIVILEGES AND IMMUNITIES OF THE EUROPEAN CENTRAL BANK" (PDF). European Central Bank. 2007. ^ Bank, European Central. "ECB to adjust schedule of meetings and to publish regular accounts of monetary policy discussions in 2015". European Central Bank. Retrieved 5 November 2017. ^ "The Eurosystem – Too opaque and costly? | Bruegel". bruegel.org. Retrieved 7 November 2017. ^ "Report on democratic accountability in the third phase of European Monetary Union - Committee on Economic and Monetary Affairs and Industrial Policy - A4-0110/1998". www.europarl.europa.eu. Retrieved 8 October 2018. ^ Bank, European Central. "The evolution of the ECB's accountability practices during the crisis". European Central Bank. Retrieved 8 October 2018. ^ "Accountability". European Central Bank. Retrieved 15 October 2007. ^ "Monetary dialogue | ECON Policies | ECON | Committees | European Parliament". www.europarl.europa.eu. Retrieved 6 October 2017. ^ "Questions to the ECB | Documents | ECON | Committees | European Parliament". www.europarl.europa.eu. Retrieved 6 October 2017. ^ "Executive Board" (PDF). Banque de France. 2005. Retrieved 23 July 2012. ^ "Interinstitutional Agreement between the European Parliament and the European Central Bank on the practical modalities of the exercise of democratic accountability and oversight over the exercise of the tasks conferred on the ECB within the framework of the Single Supervisory Mechanism" (PDF). ^ a b "All about the European debt crisis: In SIMPLE terms". rediff business. rediff.com. 19 August 2011. Retrieved 28 October 2011. ^ "Open Market Operation – Fedpoints – Federal Reserve Bank of New York". Federal Reserve Bank of New York. newyorkfed.org. August 2011. Retrieved 29 October 2011. ^ a b c "WOrking paper 2011 / 1 A Comprehensive approach to the EUro-area debt crisis" (PDF). Zsolt Darvas. Corvinus University of Budapest. February 2011. Retrieved 28 October 2011. ^ a b c d Ben S. Bernanke (1 December 2008). "Federal Reserve Policies in the Financial Crisis" (Speech). Greater Austin Chamber of Commerce, Austin, Texas: Board of Governors of the Federal Reserve System. Retrieved 23 October 2011. To ensure that adequate liquidity is available, consistent with the central bank's traditional role as the liquidity provider of last resort, the Federal Reserve has taken a number of extraordinary steps. ^ In practice, 400–500 banks participate regularly. ^ a b Bertaut, Carol C. (2002). "The European Central Bank and the Eurosystem" (PDF). New England Economic Review (2nd quarter): 25–28. ^ "Former Iceland Leader Tried Over Financial Crisis of 2008", The New York Times, 5 March 2012. Retrieved 30 May 2012. ^ Bagus, The Tragedy of the Euro, 2010, p.75. ^ Orphanides, Athanasios (9 March 2018). "Monetary policy and fiscal discipline: How the ECB planted the seeds of the euro area crisis". VoxEU.org. Retrieved 22 September 2018. ^ Bank, European Central. "Introductory statement with Q&A". European Central Bank. Retrieved 3 October 2018. ^ Bank, European Central. "ECB decides on measures to address severe tensions in financial markets". European Central Bank. Retrieved 22 September 2018. ^ "Mixed support for ECB bond purchases". Retrieved 22 September 2018. ^ McManus, John; O'Brien, Dan (5 August 2011). "Market rout as Berlin rejects call for more EU action". Irish Times. ^ "The ECB's Securities Market Programme (SMP) – about to restart bond purchases?" (PDF). Global Markets Research – International Economics. Commonwealth Bank. 18 June 2012. Retrieved 21 April 2013. ^ "How Greece lost billions out of an obscure ECB programme". Positive Money Europe. 25 July 2018. Retrieved 25 September 2018. ^ "The ECB as vulture fund: how central banks speculated against Greece and won big - GUE/NGL - Another Europe is possible". www.guengl.eu. Retrieved 25 September 2018. ^ "Unfair ECB profits should be returned to Greece, 117,000 citizens demand". Positive Money Europe. 19 October 2018. Retrieved 21 October 2018. ^ Bank, European Central. "Irish letters". European Central Bank. Retrieved 3 October 2018. ^ Reilly, Gavan. "Report: ECB rules out long-term bond to replace promissory note". TheJournal.ie. Retrieved 3 October 2018. ^ "Chopra: ECB refusal to burn bondholders burdened taxpayers". The Irish Times. Retrieved 3 October 2018. ^ O'Connell, Hugh. "Everything you need to know about the promissory notes, but were afraid to ask". TheJournal.ie. Retrieved 3 October 2018. ^ Mario Draghi; President of the ECB; Vítor Constâncio; Vice-President of the ECB (8 December 2011). "Introductory statement to the press conference (with Q&A)" (Press conference). Frankfurt am Main: European Central Bank. Retrieved 22 December 2011. ^ Floyd Norris (21 December 2011). "A Central Bank Doing What It Should" (Analysis). The New York Times. Retrieved 22 December 2011. ^ Wearden, Graeme; Fletcher, Nick (29 February 2012). "Eurozone crisis live: ECB to launch massive cash injection". The Guardian. London. Retrieved 29 February 2012. ^ Ewing, Jack; Jolly, David (21 December 2011). "Banks in the euro zone must raise more than 200bn euros in the first three months of 2012". New York Times. Retrieved 21 December 2011. ^ Wearden, Graeme; Fletcher, Nick (29 February 2012). "Eurozone crisis live: ECB to launch massive cash injection". Guardian. London. Retrieved 29 February 2012. ^ a b "€529 billion LTRO 2 tapped by record 800 banks". Euromoney. 29 February 2012. Retrieved 29 February 2012. ^ Bank, European Central. "Verbatim of the remarks made by Mario Draghi". European Central Bank. Retrieved 25 September 2018. ^ "Introductory statement to the press conference (with Q&A)". ^ Ewing, Jack; Erlanger, Steven (6 September 2012). "Europe's Central Bank Moves Aggressively to Ease Euro Crisis". The New York Times. ^ European Central Bank Decision of the ECB of 14 May 2010. ^ "ECB press conference, 6 September 2012". Retrieved 14 September 2014. ^ European Central Bank. "Introductory statement to the press conference (with Q&A)". European Central Bank. Retrieved 25 September 2018. ^ "Draghi fends off German critics and keeps stimulus untouched". Financial Times. 27 April 2017. ^ "Treaty of Amsterdam amending the Treaty on European Union, the Treaties establishing the European Communities and certain related acts" (published 23 December 2014). 11 October 1997. Protocol on the institutions with the prospect of enlargement of the European Union, Article 2, sole article, (i). Retrieved 4 January 2015. ^ a b "Winning design by Coop Himmelb(l)au for the ECB's new headquarters in Frankfurt/Main". European Central Bank. Archived from the original on 24 September 2007. Retrieved 2 August 2007. ^ "Launch of a public tender for a general contractor to construct the new ECB premises". European Central Bank. Retrieved 2 August 2007. ^ Dougherty, Carter. "In ECB future, a new home to reflect all of Europe". Int. Her. Trib. Archived from the original on 19 September 2008. Retrieved 2 August 2007. Wikimedia Commons has media related to European Central Bank. European Central Bank, official website.